Delicious and healthy, delicate and unique, each cake made by Hue women reflects such an art of delicacy. Viewers could surely sense these feelings when visiting the exhibition "Huong sac banh Hue" (The tastes of Hue’s cakes) at Hue Cultural Museum. Artisan Mai Thi Tra said, banh la vai was strongly evocative of the images of mothers and sisters in Hue in the mid-twentieth century. The name of the cake comes from the imprinted leaf veins on the cake itself after being unwrapped. 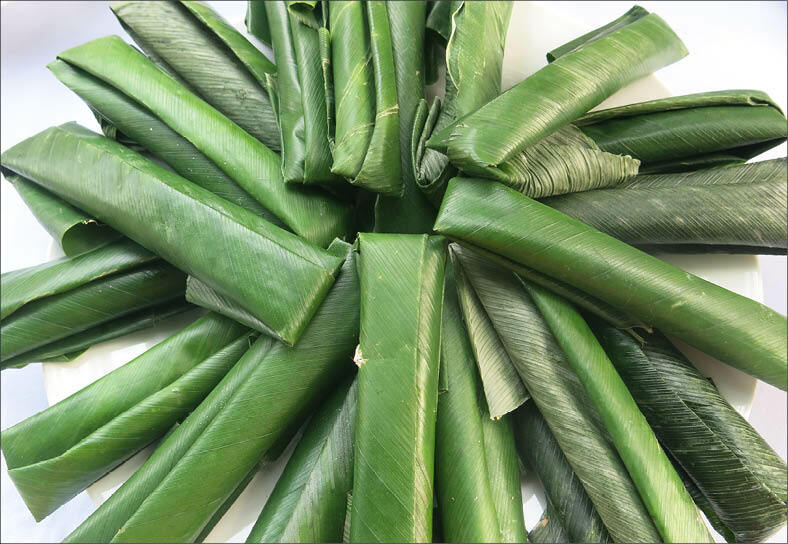 For its distinctive flavor, the cake must be wrapped with lá dong (phrynium) following a folded or curled pattern to make it looks like a lychee leaf. Unfortunately, banh la vai is no longer popular today. Lying in a humble corner of the exhibition space, the tray of bánh đúc xanh (green plain rice flan) reminded me of my difficult childhood. Those were the days when my grandmother went to market, she always brought back this green plain rice flan just as my sister and I had yearned for. The plump flan mixed with the sweet aroma of molasses was a grace, unique to the homeland of Hue. Mrs. Nguyen Thi Gai (An Dong Ward, Hue City) - who brought the green plain rice flan to the exhibition revealed that the green cast of the flan came from its wrapping leaves of a tree called bồng bồng, and the flan was usually served with sugar molasses. Today, if the white plain rice flan is still popular, the green one is much less common. Mrs. Gai is the last few people who holds on to making and selling the green flan at An Cuu market as a way to maintain the craft. Eye-catching from shape to color, bánh bắt (also known as bánh bông cây – or blossom cake) by Lady Ho Thi Kieu from Phuoc Tich ancient village attracted many people's attention. Bánh bắt was previously considered "noble" for the elite, bearing the shape of fruits, flowers, bánh sâm hoài, bánh bài, etc. Legend has it that the cake originated from the Tran Hung family in Van Xa village (Tu Ha town, Huong Tra town), the home of High Empress Thuan Thien, Mother of King Minh Mang. In appreciation of the royal’s blessing for building the family’s ancestral temple, every year on special occasions, people in the family made two carts of cakes to offer the King. Ms. Kieu said: "The traditional craft of making cakes is my family’s possession, maintained from the time of my grandmother to mine. The most distinguishing product was perhaps bánh bông cây (blossom cake). The cake is made from mung bean mixed with glutinous rice flour to create plasticity. In the past, when my grandparents cooked for the royal family in the palace, these cakes were always decorated above every other cakes in the tray." It was a rare occasion to learn about and enjoy many kinds of Hue cake in the same space, so the exhibition "The tastes of Hue’s cakes" drew massive crowds. During the opening ceremony, the exhibition space was full of people, from artisans, researchers to parents, young ladies, and even children. Familiar images such as stone flour mill, wood stove, drying rack,… the colorful cakes, powder and bean trays… displayed in this area have turned this space into such a poetic and significant exhibition. Mrs. Nguyen Hong Hoa Tranh, Director of Hue Cultural Museum said that Hue is home of many delicious cakes, each of which is associated with different origins, legends, and cultural values. 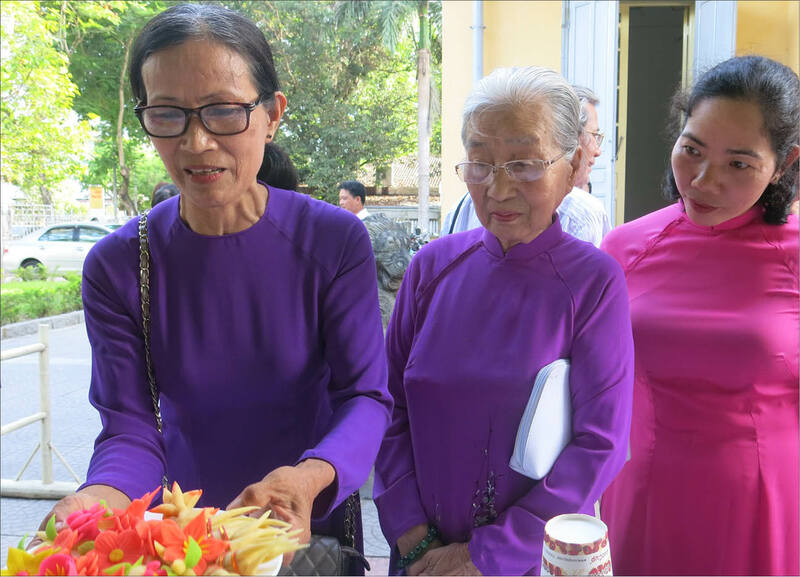 Mrs. Hoa Tranh said: "We wish to introduce this unique and appealing feature in Hue's culinary culture, so Hue Cultural Museum held this exhibition to introduce the cake that may have disappeared from the community. In addition to enjoying the taste of the finished cakes, visitors can also learn about the cakes’ origin, name, ingredients, and procedure to make them. The exhibition space characterizes Hue cakes with its detailed display, from delicate ingredients to necessary equipment and related procedures. The 24 kinds of cake made from 4 types of ingredients: glutinous rice flour, rice flour, tapioca starch, various kinds of beans, and arrowroot powder pleased all the present food enthusiasts. Each type of cake has its own processing, from elaborate raw ingredient selection to processing, and from meticulous spice mixture to sauce making. Wrapping cake buns is seen as an art of Hue women. The cake is not only delicious but also hold true elegance at first glance. Finished products are always compact and delicate enough to be savored and perpetually remembered. Special exhibition "The tastes of Hue’s cakes" has taken place from 22/6 to 22/8 at Hue Cultural Museum. During the show, Hue Cultural Museum plans to organize activities with Hue cake, such as cake making competition, cake making class, or cake tasting. It is expected that Hue Cultural Museum will reserve a permanent exhibition corner in the space of the museum particularly for Hue cake in the near future.